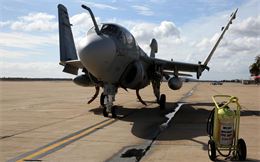 The Flying Leatherneck Aviation Museum at Miramar added a new aircraft to its historical ranks Tuesday with the arrival of a Northrop Grumman EA-6B Prowler. The aircraft originated from Electronic Attack Squadron (VAQ) 131 aboard Naval Air Station Whidbey Island, Wash.
EA-6B Prowler arrives at Miramar to join the collection at the Flying Leatherneck Museum. Marine Corps Photo by Lance Cpl. Christopher Johns. With top speeds reaching approximately 650 mph, the Prowler’s capabilities also included special systems designed to disrupt enemy radar and communications. Once enemy electrical equipment is disabled, troops or other aircraft can enter the area and either find and engage the enemy or provide crucial aerial support. A crew from VAQ-131 arrived beforehand to demilitarize and prepare the aircraft for retirement at the museum. The crew is slated to visit the USS Midway Museum to do the same to another of the squadron’s former aircraft, explained Cain. For one of the pilots, seeing the Navy and Marine Corps move toward a more technologically advanced aircraft is bittersweet. The museum staff will help to preserve and carry on the great legacy the EA-6B Prowler leaves behind. Even after it’s replaced by the Growler, Brown looks forward to a new generation having the opportunity to see the glory of her former aircraft. The Prowler is slated to be ready for public viewing at the Flying Leatherneck Aviation Museum in early March. The Flying Leatherneck Aviation Museum is free and open to the public Tuesday through Sunday from 9:00 a.m. to 3:30 p.m. For more information, please visit www.flyingleathernecks.org, or call 1-877-FLY-USMC (359-8762).